Feel free to post info that needs to be added to the wiki but you don't feel comfortable adding yourself. Be sure to give as much info as possible. 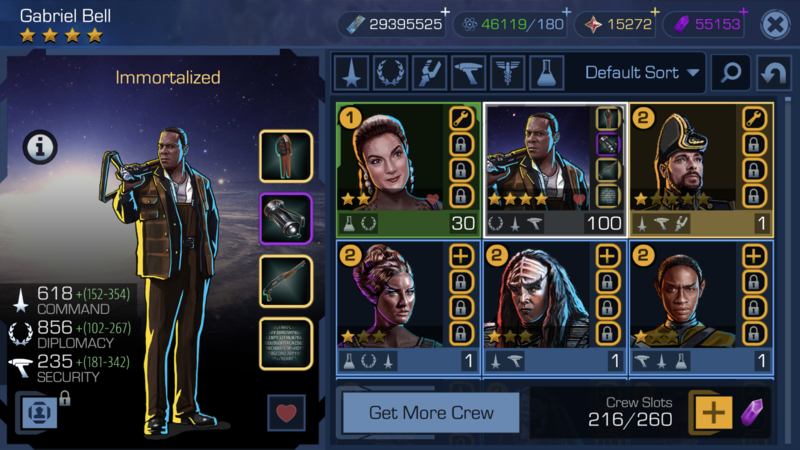 When giving "Away Team Skills" for instance be sure to mention the amount of stars on your crew and the specific Starbase bonuses on each skill. "I'm sorry Dave, I'm afraid I can't do that"
an analysis spread sheet based on FF value. so as i go, if i happen to look ill make corrections. DB needs to fire the Ferrengi and higher more Engineers, Rom doesn't count. Main thing I would like in wiki would be Voyage stats under each skill. This thread is not about "what do I want to see in the wiki"... This thread is intended for anyone having clear information that is ready to be added to the wiki but do not feel comfortable adding or don't have time etc etc. So please don't fill this thread with desires or complaints. I would urge anyone who thinks there is some sudden surge in errors in longstanding stats in the wiki remember the values in the wiki are all for the *base value without your fleet's Starbase bonuses*. On this page, the info about Persis being the only character who can unlock the node is wrong and needs updating. Gaia Odo has a base DIP score that is almost exactly the same as Persis' score when her trait bonus is already factored in, and his rolls are much higher so he crits that node with ease. I see Gaia Odo has been added, but I'd still change the text a bit. Persis has base DIP 303 + Tactician 90. With a roll of 87 to crit, total score is 480. Odo, on the other hand, has base DIP 384 but no trait bonus. His rolls, however, are much higher than Persis'. With his 54 - 134 range, he gets to 480 on 96 and above, meaning he unlocks it quite easily. 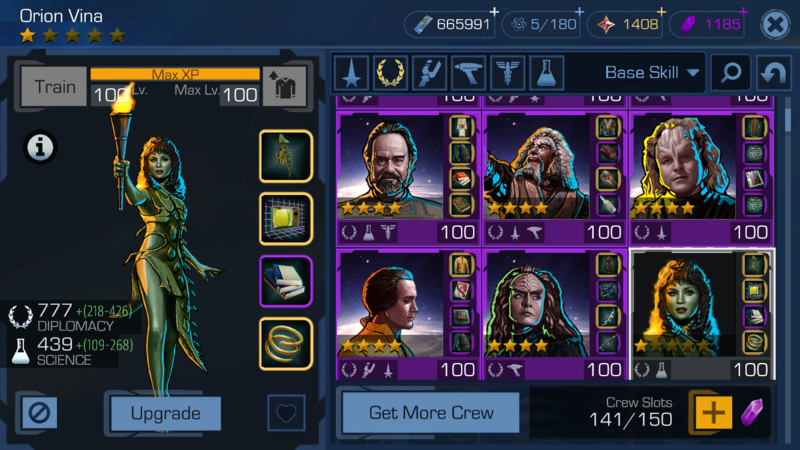 I only have him at level 1 but I note that the 1 star version of Klingon Quark is missing base stats from level 80 - 100. The link to the forum needs to be updated. I have no idea if that's something I even can edit, but I've been unable to find a way to do it. The forum link in the sidebar is only editable by admins, I believe (I'm not one of them). It's now up to date. Well, once you level him let us know the stats here and we'll put them in. The Keeper's stats need to be added to the crew with command, crew with science, crew with medicine pages. All his stats are on his individual page but not on the group pages. Orion Vina stats are wrong for at least her 1 and 2 star levels on the wiki. What are your starbase bonuses for Diplomacy and Science? Stats are correct for me, and I do not have starbase bonuses. Hmm, I guess I didn't realize that the starbase bonuses show up in the crew manifest. Did they always or is that part of the update? Dip 4% and Sci 5%. So those would be right. Sorry. False alarm. Starbase bonuses have always showed up in your crew quarters and when you select crew for away missions or shuttles. Ah, thanks, I never noticed. I'd self moderate and delete my stupid post, but it doesn't look like I have the power. My bad. I know he's rather scarce right now but Gabriel Bell needs an image. Once Gabriel is officially released, we can grab a screenshot and upload a good image. Is he?! ::waists dilithium:: Damn, well I guess all we're waiting for is for someone who has him to post a screenshot. We'll gladly do the editing, if need be. There are starbase bonuses to factor in there though. I believe that was SilverRose, so whatever eXo's starbase levels are at. If you were thinking about the stats too and not just the image. Saw this after I made a post myself asking for help, my bad. Today I got a Part 3 dilemma that granted Guinan and noticed there are no Part 3s on the wiki. 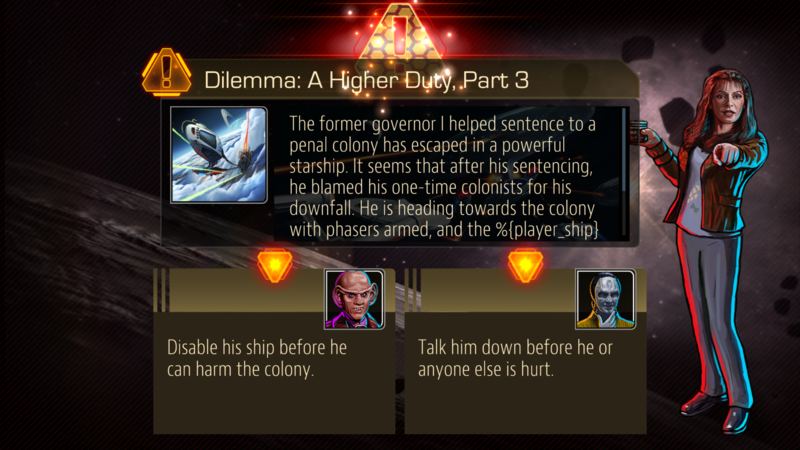 I first chose to Vigorously support the poor governor candidate, then chose to support a harsh sentence, and then chose to disable the ship in Part 3. Screen shots for wording/verification to follow. Thanks for the info. Added Part 3 to the Wiki. Amazing... many people wait a long time to get a Part 2, and out of 4 Dilemmas you got 3 consecutive parts! I often see part 2’s on 8 to 10 hour voyages but the part 3 was an awesome surprise indeed today, doubly so with Guinan. To clarify, there was no honor or Chrons, only Guinan as the reward. Wow, lucky one! 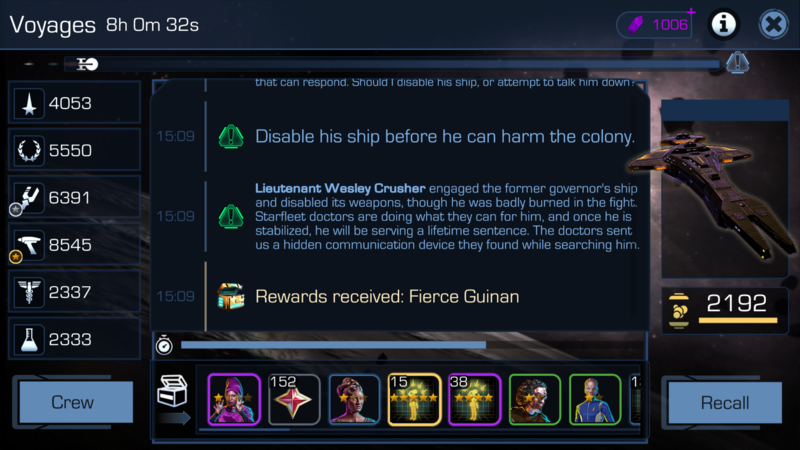 You just got Guinan, but no chronitons or honor as it looks like, so she seems to be a unique special reward for reaching a Part 3 dilemma. PS: And wow, almost 50k chronitons hoarded ... ever gunna spend them?